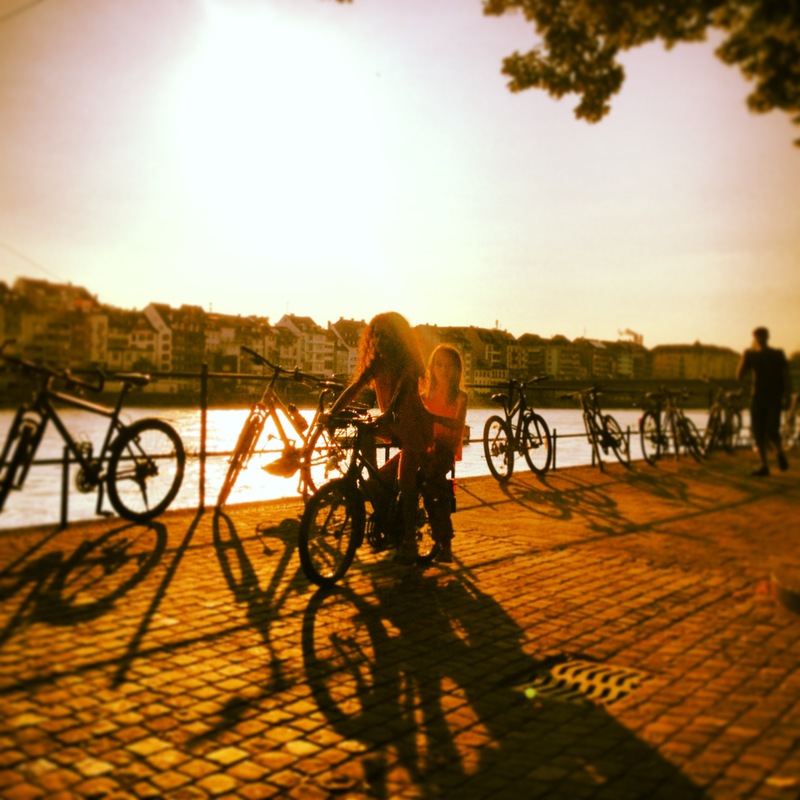 Last month, Paul and I travelled to Basel for a friend’s wedding. In an effort to save money, we’d put our plans for a long-haul trip on hold and decided to extend our time in Switzerland instead. The wedding was lovely; a really relaxed affair with great live music and delicious food. We had canapés and champagne in a courtyard in the old part of town, accompanied by New Orleans-style jazz; second-lined down to the river for a boat trip on the Rhine; and finally danced ‘til 4am at a very funky dockside art exhibition centre. The bride and groom even got behind the mic and decks – respectively – to entertain us. Great fun! After nursing our hangovers, we spent some time the following day exploring Basel, climbing to the top of Münster cathedral for views over the city, walking through the botanic gardens and Altstadt, and eating sausage by the river. We even managed to fit it seeing Andy Murray win the Wimbeldon final, which added an extra layer of excitement to the day! But soon it was time to move on to our next destination. 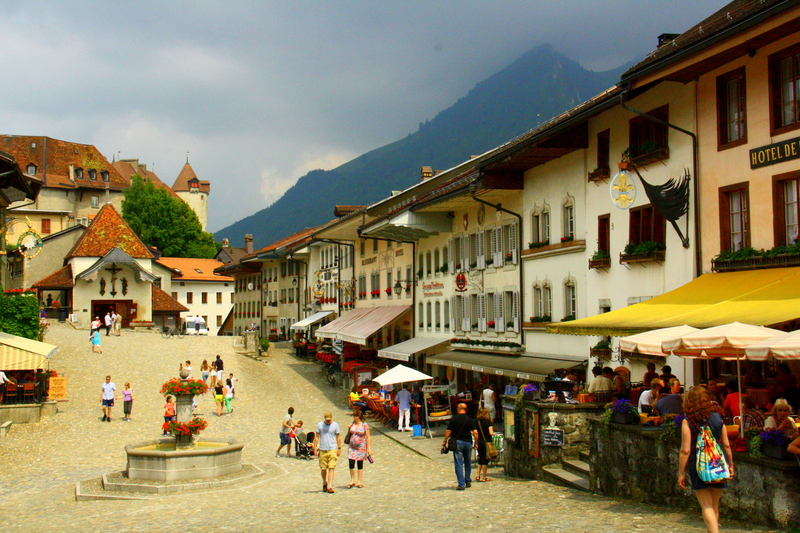 Hiring a car, we travelled down the country to Gruyères in the Fribourg region. Yes, that’s where the cheese comes from! Incidentally, it’s one of my favourites…if you were ever looking for an edible present for me. The little town is straight out of a film set; so quintessentially Swiss. Little chocolate and cheese shops line the main street, waitresses serve tourists fondue and raclette – even in the height of summer (and yes, of course I had some) – and the imposing hilltop château looks designed by Disney. After looking around the castle, and enjoying a bizarre and comical audio-guide narrative from the ‘court jester’, we continued onward to Montreux. When planning the trip, we’d quickly discovered that we’d be in the country at the same time as the famous Montreux Jazz Festival. This year, the festival was showcasing Prince, Gregory Porter, Bobby Womack, Of Monsters and Men, Bonnie Raitt, Valerie June, Kraftwerk and many others…frustratingly, we couldn’t afford any tickets, but that’s not important. There was plenty of free music in the park and along the riverfront, plus after-show gigs and jamming sessions to enjoy. Since we’d quickly discovered how ludicrously expensive restaurants in Switzerland are, it was also a godsend to eat at the festival’s food stalls. Good food to choose from too: burgers with gorgonzola fondue, tartiflette, gaufres… We saw some great music, and some not so great – the orchestra playing nothing but Depeche Mode covers was a low point; the Avishai Cohen Quartet a high. Montreux is set on the eastern edge of beautiful Lake Geneva and we were staying in a local’s home (found on Air BnB, to which I’m a complete convert) with a large terrace overlooking the lake and town. As well as listening to music, we spent a day visiting Château de Chillon – a chocolate-box castle about an hour’s walk east along the lakeside – and Vevey, where the sculpture of the giant fork in the lake that adorns many a postcard can be found. While we weren’t overly impressed with Vevey, I’d definitely recommend Château de Chillon. It is such a photogenic building and has a really interesting history (and a far superior audio-guide…yes, we do keep score). Dating back possibly as far as 1005, though it is not clear exactly when it was built, the castle was home to the Counts of Savoy as well as many others over the years. But although it changed hands frequently, it was never invaded due to its strategic position on an island rock. It is also the star of various books and poems, most notably Bryron’s The Prisoner of Chillon, and his graffiti can be found in the cave stores under the castle. 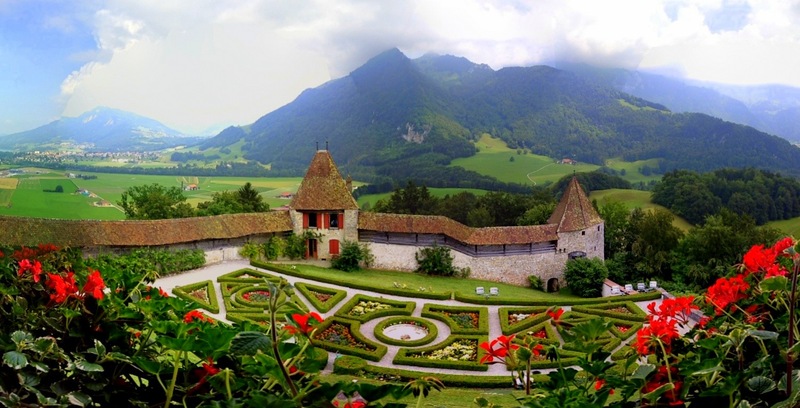 Now open for tours, it is listed as Switzerland’s most visited historic landmark. A word of warning though – we discovered two things on the journey from Chillon to Vevey: 1) it is not clear how you pay for bus tickets; and 2) the Swiss bus inspectors are scary SAS-looking guys who travel in packs and look like they’d be happy to shoot you if you gave them even the flimsiest of causes. The following day, we caught a local train to Chexbres in the Lavaux wine region and walked through the vineyards to Saint-Saphorin, looping back round via Riyaz. It was about 35°C and the ‘gentle stroll’ felt nothing but by the end, but the area is stunning and the little French-speaking villages very quaint. After rehydrating and having a lunch of tuna carpaccio and saffron coley in the village of Cully (yum! ), we drove to Château d’Aigle for another castle tour. The thunderstorm that had threatened for days finally arrived when we were inside the walls – very atmospheric, but resulting in an extremely soggy run back to the car. Bidding farewell to Lake Geneva, we travelled next to Sion – a medieval cobbled town famous for its two imposing hills, with the remains of Château de Tourbillon atop one and the Basilique de Valère opposite. Our stay here was short and it would have been nice to have had longer, as the town has lots of nice little restaurants and the setting is lovely. We did have time to follow the suggested route around town and up to Valère for views across the valley and a wander round the church. And time for a baguette from a little Italian deli. But we missed the birds of prey show at the fort, unfortunately, because it was time to get back on the road: destination Täsch. It is from this little transport hub that you board a train to Zermatt, cars not being permitted in town. Our time in Zermatt was easily my favourite part of the holiday. A charming ski resort at the foot of the Matterhorn, it’s almost as popular in the summer as winter due to the many hiking trails and sporting activities to be found in the region. And, anyway, there was still snow to be found in July and plenty of determined skiers and snowboarders ascending the slopes! We stayed in Cœur des Alpes (“heart of the alps”), an amazing boutique hotel with its own spa and jacuzzi deck. Very luxurious! But as well as chilling out in the pool with glasses of wine, we took a very exciting trip high up into the alps. You can buy (for a hefty price) a return ticket from the cable car station in Zermatt (1620m above sea level) all the way to Klein Matterhorn (3883m a.s.l. or 12,739ft!). That’s seriously high, I can tell you. Along the way, you get out at Furi, Schwarzsee and Trockener Steg, the views getting more stunning (and the cable car ride more precarious) at each stage. 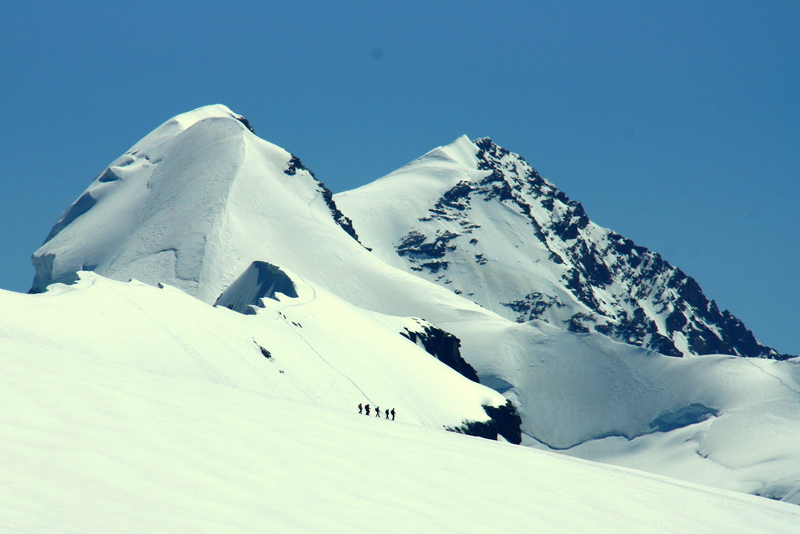 The final leg, between Trockener Steg and the glacier at Klein Matterhorn, is actually petrifying; there are no struts supporting the cable for most of the near vertical ascent! Luckily, the 360° panorama of the snow-capped alps, stretching as far as the eye can see, is more than worth both the price and the white-knuckle trip. It was -3°C at the top, but the sun kept us feeling reasonably warm and able to stand admiring the view for a long time. You’re also able to take a lift (how and who built these things, I just don’t know!) down into the glacier, where tunnels have been hollowed out and ice sculptures built. It’s even colder down there and my toes were soon numb. Having not wanted to fill our suitcase with coats and thermals just for one day of our trip, we instead simply layered up with t/shirts, cardigans and socks. It worked…kind of! This entry was posted in Travel and tagged Alps, Basel, Château de Chillon, Chexbres, Gruyères, Lake Geneva, Matterhorn, Montreux, Sion, Vevey, Zermatt on August 25, 2013 by victoriassecretblog. Amazing photos as always Vix.